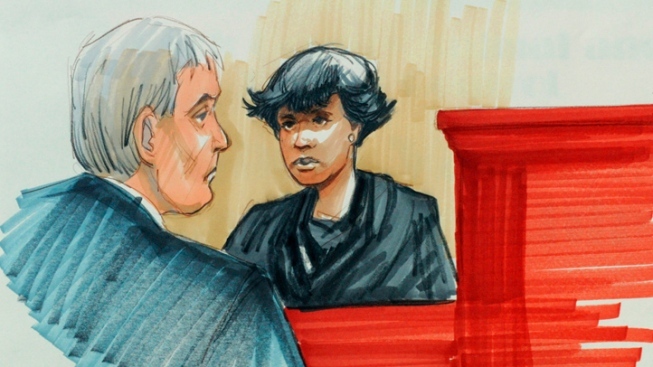 Jennifer Hudson was the first witness called in the trial of William Balfour, the man accused of killing three members of her family in 2008. Hudson, dressed in all black, spoke so softly the judge had to ask her to speak up, the Chicago Tribune reports. She described growing up on Chicago's South Side and leaving her family's home in 2006, just before Balfour and her sister, Julia Hudson, began dating. "Where ever he was, I tried not to be," Jennifer Hudson said of her former grade school classmate. Hudson said her family lived on the same street as Balfour. She said she and her family didn't want her sister and Balfour to marry. She cried on the stand as she talked about her family and the last time she saw them. She said she routinely texted her mother every morning but received no response on Oct. 24, 2008. She received a frantic phone call from her sister hours later. Hudson said she immediately flew to Chicago to identify the bodies of her mother and brother, according to the Tribune. A former federal prosecutor said it was shrewd of prosecutors to call the actress and singer as their first witness. Chicago attorney Phil Turner said the move "rivets the jury." "For better or worse it increases the importance of the case in jurors' minds," he said. "Now the jury knows everything about her and that she's in the courtroom only accentuates that this is an important case." When Hudson's sister, Julia Hudson, testified later in the day about her ex-husband's alleged threats against her family, Jennifer Hudson was watching from a fourth-row bench, clutching a pink bag of tissues. She bowed her head and wiped away tears as prosecutors played a recording of the 911 call her sister made after discovering their mother's bloodied body. "Oh my God, oh my God," Julia Hudson is heard yelling at a dispatcher, who tells her to stop screaming because he can't understand her. "My momma, my momma!" Prosecutors say Balfour killed Hudson's mother, Darnell Donerson; Hudson's 29-year-old brother, Jason Hudson; and her 7-year-old nephew, Julian King, in a fit of jealous rage. They recounted in court the threats they say Balfour repeatedly made against Julia Hudson and her family. "Julia, if you leave me, I will kill you. I will kill your entire family. You will be the last to die," was allegedly what he told his estranged wife after she asked him for a divorce and told him she was seeing another man. According to court filings, Balfour showed up to the family's home on the morning of Oct. 24, 2008, and noticed balloons that Julia's new boyfriend sent her for Sweetest Day. He got angry, punched the balloons, then lingered outside the house, according to the documents. The couple was divorced prior to the murder, but court documents say their physical relationship continued just days before the murders. Balfour has pleaded not guilty to the slayings, and the defense presented a different theory of the case, saying Jason Hudson was targeted because he was a major drug dealer in the Englewood neighborhood. "They did nothing to determine if Jason Hudson's violent business lead to these murders," said Balfour's lead attorney, Assistant Public Defender Amy Thompson. There are no known witnesses to the slayings, and it's unclear what physical evidence exists, including fingerprints or DNA. Thompson told the jury that the murder weapon was tested for DNA and did not match Balfour. The family's Englewood home has been boarded up since the murders. Opening arguments began around noon at the Cook County Criminal Courts Building, more than an hour later than expected. The judge spent a half hour getting the jury ready, explaining rules to them, making sure everyone could hear, and ushering in the media, which includes national and entertainment outlets. A retired CTA dispatcher, a former Jesse White Tumbler, a FedEx courier with two kids and a data analysis manager make up part of the 12-member jury and six alternates who will decide Balfour's fate. If convicted of at least two of the murder counts, the 30-year-old Balfour would face a mandatory life sentence.